Each capsule contains 5 billion active cells, concentration guaranteed until expiry date. Maltodextrin, vegetable capsule (hypromellose), magnesium stearate, titanium dioxyde, ascorbic acid. Cranberry is used to help prevent infections of the urinary tract (UTIs). ADULT: Take 1 capsule twice a day at breakfast and at supper. Use a minimum of 4 weeks for beneficial effects. Take 2-3 hours before or after antibiotics. The urge to urinate comes on very suddenly ? Your visits to the bathroom are frequent ? You are experiencing pain or a burning sensation while urinating and a feeling of incomplete evacuation ? These are the classic symptoms of a urinary tract infection, a problem that particularly affects: the elderly, diabetics, pregnant women, men with enlarged prostate, individuals with a catheter and patients with kidney stones. A surplus of harmful bacteria such as Escherichia coli causes cystitis, otherwise avoided by the protective barrier formed by the good bacteria in a healthy urinary tract. Probaclac helps restore good bacteria in the urinary tract to fight urinary tract infections. How to take Probaclac Cranberry ? 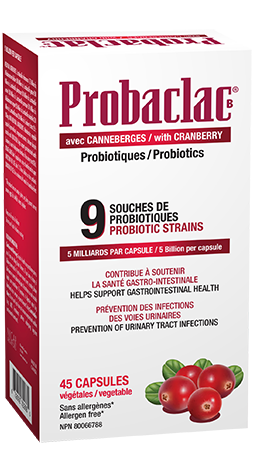 To prevent urinary infections, nothing better than combining probiotics and cranberry ! Our product combines 9 human bacterial strains (concentration of 5 billion active cells per capsule) and an extract of cranberries (200 milligrams in the same capsule). Beneficial bacteria recolonize the intestinal and uro-genital environments while cranberry provides pro-anthocyanidins (PAC) that prevent pathogenic bacteria from residing in the bladder. Prevention is key… Take the supplement for a minimum of 4 weeks to allow it to work as intended. How to make sure the cranberry concentration is effective ?